Capricorn Horoscope 2016 predicts that you will review your objectives in life and form strategies to achieve them during 2016. You will define your goals precisely and take stock of your capabilities. You will learn new skills to suit your needs, and will disown all unnecessary things. The Capricorn 2016 astrology forecasts also suggest that proper examination of outside information is necessary. You should be ready to terminate friendships which are an obstruction to your progress. You should not be bogged down by previous emotional baggage and feel free to express yourself. Planet Jupiter will help you with plenty of resources and there will be no hindrance to your progress in life once you decide your targets. 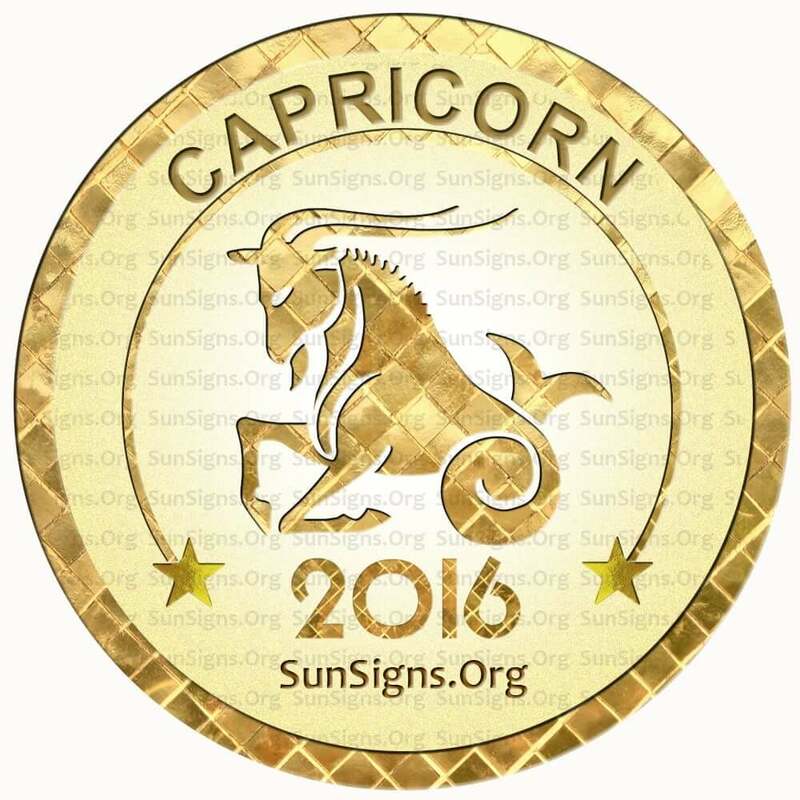 Year 2016 promises to be encouraging in matters of relationships for the Capricorn zodiac sign. Things will move fast and without your effort from the beginning of the year. You have to just follow the events and be happy. Opportunities for forming relationships are plenty throughout the year. Month of February 2016 is a good period for sorting out any obstacles. While June 2016 onward you will form serious and committed love partnerships. This is also a good time to plan for a pregnancy. Try these Feng Shui tips to get pregnant. The Capricorn 2016 horoscope foretells that you need to concentrate on emotional stability and harmonious relationship with your colleagues and superiors in your profession this year. You can stake your claim for a senior position or for getting a challenging job in the office. Minor irritants in business caused by others should be ignored, and you should try to maintain your composure while facing obstructions to your progress. Capricorn, be confident and be aware of your responsibilities. The 2016 zodiac predictions suggest that you need to make your financial strategies on investment and savings from May to October. Modifications to money planning if required should be done during this period. You can make efforts to recover money due to you during the last two months of the year, and this will contribute to your savings. You have to work out clear monetary strategies in a peaceful frame of mind and your emotions should not obstruct your thinking. Family will be supportive of the Sea Goat’s efforts to make money. The Capricorn 2016 horoscope foretells that your vitality will be excellent during the early part of 2016, but your preoccupation with business and profession will require plenty of your energy and emotional reserves. From April onward, you should concentrate on relaxing as much as possible. Proper diet and creative arts will help you to replenish your stamina. Your family will be a source of happiness and the family environment will be soothing and enjoyable. In 2016, the Capricorn people need to decide on what is important to your development in life and take the help of your associates in completing those projects. In 2016 your efforts will be directed towards building higher degree of self-confidence. You have to review the pros and cons and decide on those which will add to your self-worth and follow those principles. Eliminate all Capricorn personality traits which are not useful in helping your progress. Planetary positions in your birth chart will bring in a sense of stubbornness during this year. There will be unexpected modifications in the areas that are proving to be an obstacle to your growth in life. It is essential that you make a true assessment of the direction your life is following and make drastic changes in your personality to improve your life. The 2016 Capricorn horoscope also predicts that you can use your positive traits to your advantage and discard those which are not helping your development. Your mind will throw up visions based on your instinct and you can convert them into realities. Be careful about your communication as it may make you a celebrity or infamous depending on the nature of expression. The 2016 Capricorn zodiac predictions forecast that you will be more interested in understanding the mystic forces surrounding you this year. These impressions may lead you to delusion or misconceptions. Your focus should be on enhancing your spiritual values and increasing your awareness. This will help you in discovering your creative talents. You should be ready to accept new ideas by overcoming your stubbornness which will help you to diversify your areas of growth. Your true personality will emerge if you align yourself with Divine forces. Capricorn, your progress in life will be helped by the restorative energy bestowed by the planets during the year. It is time to overcome old traumas and sense of guilt which are proving to be an obstacle in your life. This can be done by using your inner strength. Use your personal confidence to evolve as a complete person and you can achieve success by diligence. The Capricorn horoscope 2016 predicts that the effect of planet Saturn will be dominant in January and February 2016 as well as to some extent in September and October. It is important to decide the factors which are guiding your life and set your priorities. Concentrate on regulating your activities and life instead of interfering in the life of other people. January 2016 is a month of personal happiness and rejuvenation. This is not the time to make important decisions in life. February 2016 is a month of visualization and planning for the Capricorn star sign. March 2016 is a period when you need to tread with care and not take risks, forecast the Capricorn 2016 horoscope . April 2016 is a month when you need to relax and take care of your muscles. May 2016 will see some problems on the family front that need to be resolved. June 2016 is a good month for detox programs and weight loss activities to be tried out. July 2016 is a month when better financial management is needed. August 2016 is a sexually satisfying month for the Capricorns. September 2016 will see the beginning of progress in your career and job. October 2016 will be a prosperous month for the Capricorn. November 2016 asks you not to indulge in ego and high self-esteem. December 2016 will be the best month in the whole year as there is nothing that can stop your progress. The Capricorn horoscope 2016 thus concludes that this is a year when you need to come out of your comfort zone. And you have to look at the different mysteries in life from a new perspective.